If you're using Microsoft Money to keep track of your company's finances, we have the perfect style of laser business checks for you! 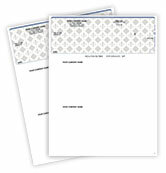 The Microsoft Money Top Check is completely compatible with MS Money accounting software. It prints clearly in both laser and inkjet printers and is available in 12 color choices. 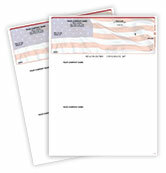 This selection can be effectively used for both payroll purposes and general disbursement. Check Size: 8.5" x 3.5"
Our Microsoft Money Checks are guaranteed to meet or exceed all American Banking Association standards. That means you can be sure all banks will be able to process them. If there are problems - we'll work to resolve them - and we'll reprint and re-ship your order at no cost to you. Need next-day shipping? Please see our frequently asked questions page for details. Orders typically leave our warehouse within three business days.